I have a confession to make, I am a hoarder. I hoard pictures, pictures on my phone, pictures on my tablet, and more pictures on my computer. I even have a a folder on my computer titled Pictures to Develop. This is is where I stash all the photos I plan to have developed to fill up scrapbooks. Since giving birth to my daughter 10 years ago I have taken countless pictures, some terrible, some good, and some that really deserve more than just a small place in a dusty photo album. With Canvas Factory you can make that gorgeous photo you took of that memorable time in your life and turn it into a work of art. They will take your prized image, print it on to durable canvas, than stretch or gallery wrap it onto a wooden frame, ready to display on your wall for all to see. I was given the opportunity to create my very own canvas print using Canvas Factory's simple online service. 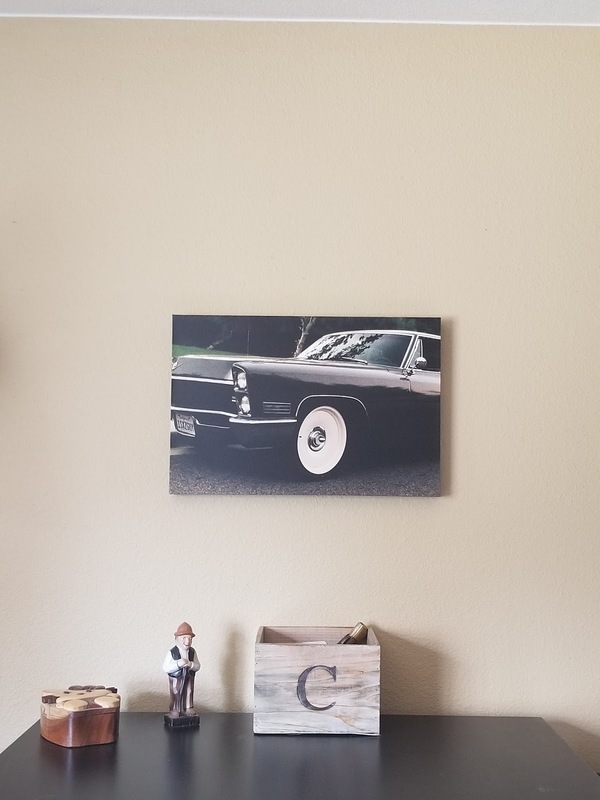 You upload the image you would like printed, choose the size and shape of your canvas, submit your order and wait for your new wall decor to arrive on your front step. It's really that easy. So which one of my many pictures did I decide to choose for my very own canvas print? A picture of one of my husbands prized possessions of course, because that's what you do when you are a wife and a mom, think of your family first. Plus, Father's Day is coming up so I figured this would count as a gift...right? One of my husbands prized possessions happens to be his 1967 Cadillac. Here is the same picture on canvas. This is one of Canvas Factory's 16x20 prints. I couldn't get the image sized so it would fit completely on the canvas but I think it looks more artistic like this anyway. I also think the gallery wrap feature ups the quality on this canvas print. My husband was so excited to get this, yep I think Father's Day is covered. Speaking of Father's Day, Mother's Day is just around the corner and Canvas Factory's canvas prints would make a great gift for the special mom in your life. Do you have a photo of the family that needs to me memorialized for mom? Or maybe a photo of her favorite place, or flower. Hey you know your mom best I am sure you can come up with the perfect wall piece to gift her with. ....and now for something Canvas Factory would like to gift one Girly Girl reader with. One of you will win a gift code to use towards your very own canvas print. Giveaway is open to US and Canada residents. Please be sure to leave a valid email address in your comment so that I may contact you if you are the winner. I would love to have a canvas of the crab apple blossoms from a tree on our yard. Our latest family pic! Or my cat. I'd like a picture of my daughters on a canvas. I would love it for a family portrait. I would want a picture of my granddaughters. I'd want to do a picture of my kids. I would get a picture of my 5 daughters if I won. I would make a picture of my daughter's dog! I would get a picture of my niece for my sister. I would love a picture of my parents in my canvas print. Would like to have a picture of my sons. This would be a present for my niece. I would use a picture of her cute baby boy. I would love to have our family vacation picture in South Dakota put on canvas! Our last family vacation photo.